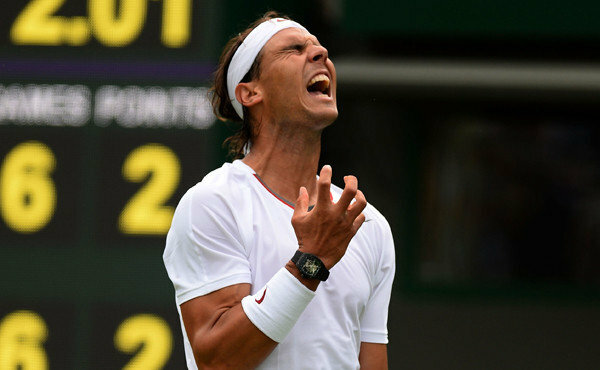 Who is rough on Rafael Nadal? Rafael Nadal. I wrote a piece over a year ago about how Rafa will probably not outlast, in career longevity, most of his contemporaries of similar age, perhaps some of his seniors as well. This had to do more with his style of play than anything else. The loss to Steve Darcis of Belgium in the first round at Wimbledon was huge. Is this an indication of things to come? Could be? His continued Energizer Bunny style of play is the indicator to me. If the batteries are too good, the bunny may wear out before the batteries if it the bunny doesn't employ some efficiencies and less exhausting tactics. I love to watch the athleticism, the court movement and passion Rafa plays with, but I also love to see a veteran pro decipher and tear down his junior's game by being patient and using all he or she has learned, not because they physically have to, but because they mentally know how to. It's easy to understand the reluctance to change (if it has even been considered). What got him here, got him here. How profound. Rafa has begun using more of the forecourt effectively and has stuffed a few new bullets in his holster, but I would hate to see Nadal have no choice but to resort to a Wait and See or Roper Dope strategy. It would be wonderful to see him trade in that Bugatti Veyron he's been driving around the court (before he puts it in a guard rail), on his own accord, for a 2013 Range Rover. Perhaps he'll handle the different terrains better and stay around longer so he and we can enjoy his game and passion for tennis.